Today was a big day! The morning started off by Grant picking out what he was going to wear. 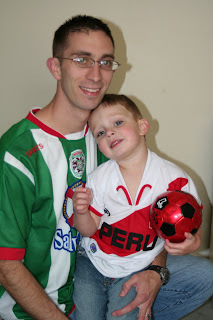 He was very insistent to wear his favorite soccer shirt since it matches his cousin, Jaybin. So, of course, he wore it! When Chris noticed he was wearing a soccer shirt, he pulled out his soccer shirt from Honduras so that they could "match." Isn't he cute? So they matched, and Grant was thrilled. He got the soccer ball, took Chris' hand and told mommy, "Picture!" So of course we commemmorated the occasion of their matching Soccer Shirts. Ha! 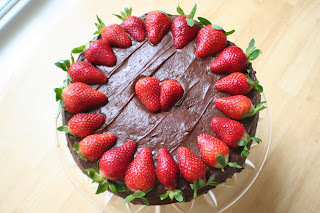 I made Chris a yummy Chocolate Cake for Valentines Day. Doesn't it look so pretty? If you want the recipe, click HERE. We spent the afternoon driving around looking at houses and peeking in windows! The boys were great in the car. Both of them slept almost the whole time. When we got home, Chris' parents showed up not long after. I fixed them Spaghetti for dinner and as we were preparing to walk out the door (Chris had planned to take me out that night for Valentine's Day), I gave the boys each a hug and kiss. As I stood up from hugging Mason, he reached for me and took 3 whole steps! I was so excited. I think I scared him! I didn't think he'd be trying to walk for a while. So he has proven me wrong yet again. The most we've gotten is 5 steps, but he's on his way towards being a big boy! Chris and I tried to go to a sit-down restaurant, but everything was so busy, so we went to the food court at the mall instead and shared Sbarro's. Ha! We laughed about it. Then we went to see the movie, "Taken." It was really good, though probably not the best choice for Valentine's Day. It definitely wasn't romantic, but it did keep us on the edge of our seats for the entire movie. We recommend it! So we had a great day. It was so nice to be together. We had pizza in the car (papa john's) on valentine's day too and also saw Taken! ;-) how funny...we often have that problem when we go out on dates to restraunts...the waits are always so long, sometimes we opt for convenience instead! Even though you had to settle for Sbaro's (YUM! ), I'm glad that you enjoyed your night out TOGETHER! YAY, Mason, for taking your first steps! It makes me so sad to think about how I've missed all of your growing up. Sara, that cake looks DELISH! I'm not surprised, however, since everything you cook/bake looks/tastes wonderful! I'm excited to see what new recipes you include on your recipe/tablescape blog!